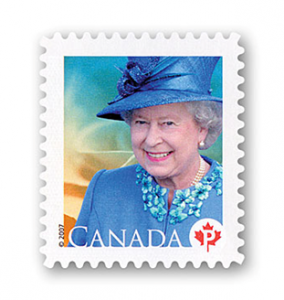 Modern postal history in Canada started toward the end of World War II and lasts up until the present date, though many cite it as beginning around 1953, which is when King George VI died and passed the throne onto Queen Elizabeth II. Stamps of this era take a variety of unique forms, with many unique designs emerging, as well as unusual shapes and the development of self-adhesive, which is used today. There are a smaller number of rare Canadian stamps in this time period, though they are still widely sought by collectors. This era in Canadian stamps began with an issue for Elizabeth II, featuring her portrait as depicted by Yusuf Karsh. It was depicted upon a simple background, and offered for five different values, which issued in May of 1953. In 1954, a new version issued, using instead a portrait by Dorothy Wilding that was also circulating in the UK. These were in use until 1962, when a new design from Ernst Roch was offered instead. Beginning in the 1960’s, commemorative Canadian stamps have generally been issued at whatever the present first class rate is, and have featured the work of prominent artists, as well as wildlife depictions, architecture, and plants. Notable stamps also include a series of Queen Elizabeth II stamps issued fro 2003 to 2006, each using an image taken by Bryan Adams, the famous rock star. If you are interested in modern Canadian stamps, contact Treasure Coast Stamps to learn more about these interesting pieces of history.